add 39,00 € for FREE delivery! The hairy rockrose (Cistus incanus) is a tea plant with a particularly high polyphenol content. A pleasant, herbal-aromatic taste. The hairy rock-rose (Cistus incanus), a native to the Mediterranean tea plant, contains a large quantity of polyphenols. Especially in Greece, has the cistus-tea a long tradition, however, has passed into oblivion over the years. In 1999, Cistus incanus has won the "Plant of the Year“ award und thereby rediscovered. 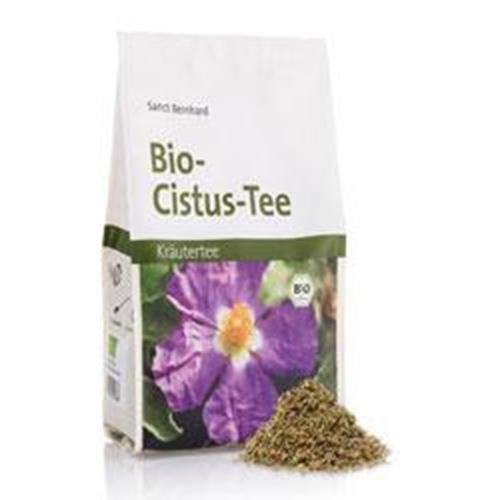 Bio-Cistus-Tea has a pleasant and tartly taste. A tea for every day, in the evening and to quench the thirst. Take 2-3 tablespoons in 1 litre of boiling water and - depending on taste - let stand for 2-5 minutes. Only that way you get a safe food. Our tip: Refine with lemon and honey. 100% certified organic Cistus Incanus. Average rating: 4.9 out of 5 based on 15 valuations. For legal reasons, we point out that the following user ratings reflect only the opinions of users of our products. The evaluations come about without our influence, we only give them directly and unfiltered, without making them our own. Muy bueno, nunca lo había probado y lo recomiendo. Una infusión imprescindible y de gran calidad para acompañar cualquier protocolo de detoxificación ya que rompe el biofilm de protección de los patógenos, y evita que te pique garrapatas u otros insectos. Estupenda infusión, muy agradable de tomar. Estoy contento con cuanto les he comprado tanto es así que en unos días voy a volver a comprar varias cosas; y más les compraría si tuviese catálogo de productos y comentario de las virtudes que cada una tenga para la salud. Suelo tener infecciones de garganta. He leído mucho sobre el cistus y parece ser que es muy efectivo contra dichas infecciones. Ya os contaré cuando empiece a probarlo. Infusión de sabor agradable, la tomo por las noches para mejorar mis defensas, no he enfermado ni he cogido ningun catarro desde que la tomo. Espero que sea util tambien para la gripe y los resfriados. Endulzado con miel sabe mejor. Recomend this product to a friend via email.